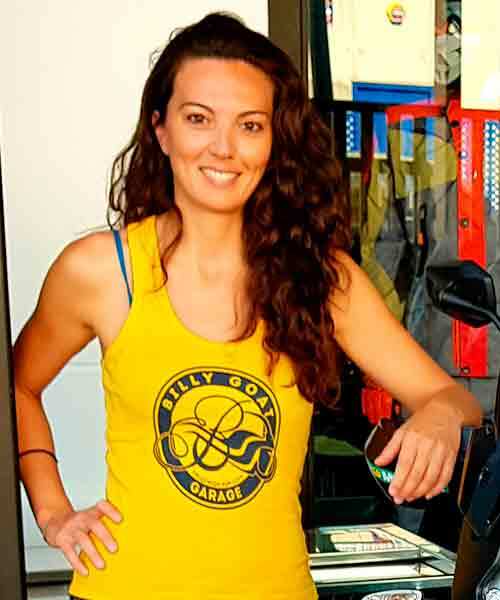 The goal of BillyGoatGarage® is moving away from traditional forms of tourism and to show their ability to adapt and to offer innovative products in “adventure experiences”. This is the reason because we offer “adventure off-road courses” and tours in Andalucia (Spain),Europe or Morocco- Everything is possible thanks to our maxitrails (KTM 1090 Adventure R), the best gear, an exceptional private circuit of 10km of tracks located in Loja (Granada). Furthermore we count on with some of the experienced Dakar rally rider instructors. They are specialized in a variety of off-road riding. To make your tours and routes with your hire motorbike we put at your disposal our app. It will you guide on different areas. 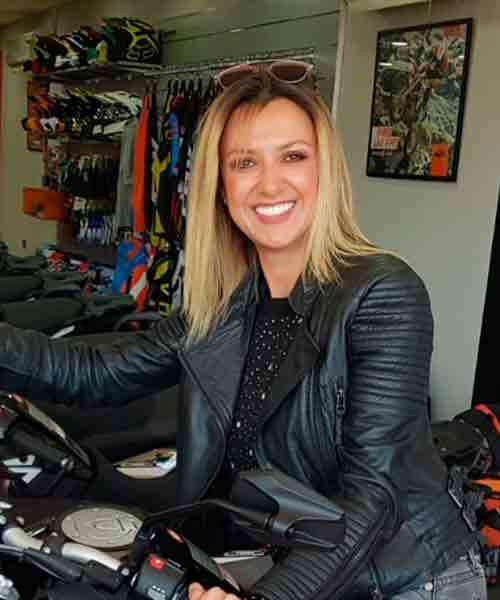 Motorex, Pirelli, Motos Garrido- Touratech Málaga, Scorpion, LS2 Helmets, etc. Computer engineer, passionate about the world of motorcycles. Certificate in tourism. She organizes trips and bookings. Our KTM 1090 Adventure R, is the perfect bike to enjoy both on road and off-road trails. A bike consciously chosen for its adaptability on more or less complex roads thanks to its electronics and WP suspensions. The only engine different from the rest of Japanese brands with rabid character but dosable and always controlled thanks to its Brembo brakes. A thoroughbred of 230 kilos and 125 horsepower which allows it to be more agile than other motorcycles in its category. We also know that details counts and that is why the stirrups, the screen and the handlebars are adjustable. And the perfect complement, Pirelli Scorpion STR tires, are a must. Dakar rally rider-instructors – BillyGoatGarage tour-guides. Considered as the masters of off-road driving techniques, they will give you the wisdom, guide you and teach you their techniques. They are experienced riders, accustomed to all types of terrain and adapt to all levels of driving. Professional rider linked to the world of Raids and Enduro competition for years. He has participated in 12 Dakar rallies and was third in 2017. 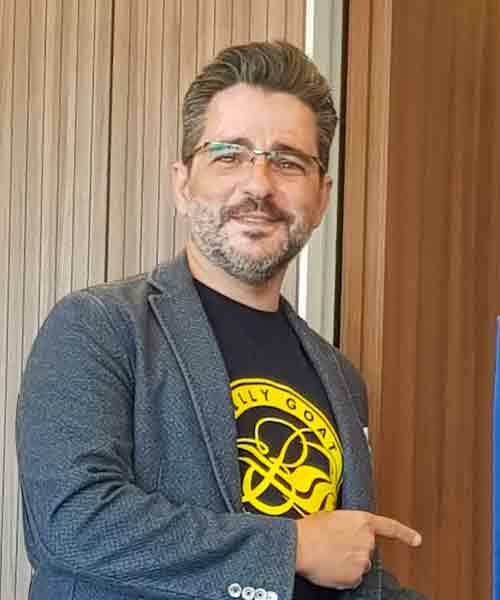 He is very respected for his constancy, discretion and technique, which does not detract from a special charisma that invites you to follow him and share the good times. 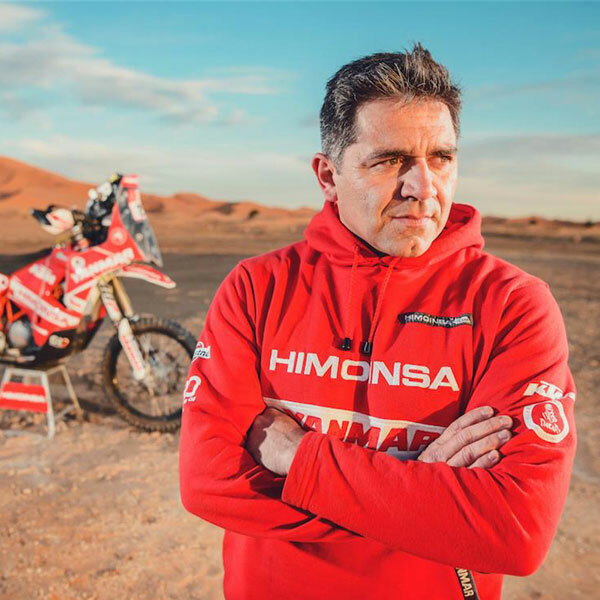 One of the most experienced coaches in the world, the former pilot and colonel of the air army led the eagle patrol and has participated 16 times in the Dakar rally, being Laia Sanz’s backpacker and has been Team Manager of the Himoinsa team for 3 years. He will teach you how to face a full day dedicated to off-road. He is a legend in the world of rallies because he has participated 16 times in the Dakar being Peterhansel’s main competitor. He has also excelled in other disciplines such as enduro and motocross. He is currently an advisor to the Yamaha team on the Dakar. He started in enduro in 2005 but in 2016 he jumped into the world of raids taking part in the Dakar in 2017 and 2018, finishing 29th. He was Gerard Farrés’ backpacker and will start his solo march on the Dakar in 2019 with the best prospects..
Manolo Barnés (born in Lorca, Murcia, Spain) is an expert guide, with great skills for experienced navigation enduro pilot and Mountain Bike. He has participated on three times in the Dakar. He started in enduro in 2005 but in 2016 he jumped into the world of raids taking part in the Dakar in 2017 and 2018, finishing 29th. He was Gerard Farrés’ backpacker and will start his solo march on the Dakar in 2019 with the best prospects. One of the best training centers in Europe. A training center of 200 hectares with an initiation area and 10 km of tracks, all kinds of terrains and also of turns to practice. Located in Loja (Granada) 30 minutes from the airports of Granada and Malaga and near the town of Riofrio. After analyzing different options, it was considered that the KTM Rally 2017 Gear (trousers and jacket) and FOX helmets, boots and gloves were the best option on the market and one of the safest for on-off road activity on the routes. They are adaptable, waterproof and breathable allowing movement in every maneuver. BillyGoatGarage® wants you to get to know Spain from one point to another on top of one of our KTM 1090 Adventure R motorcycles. That is why the rental points are located in the south of Spain: Malaga (Motos Garrido, Alhaurín de la Torre) as well as in Almería. They are the perfect starting points for your routes throughout the year thanks to the best weather and due to their connections to the rest of Spain and Europe. Thanks to the High Speed train and the Malaga international airport we are well connected to the world. There is also a transfer service available on request and free of charge for all our riders. We found charming accommodations you to enjoy and relax during the travel..
BillyGoatGarage® declares itself a defender of the natural environment. The KTM 1090 Adventure R is regulated by the “Euro 4” pollution regulation, emitting 56% less CO, reducing THC to 50%. We are committed to group activities with a limited number of just 8 pilots to reduce any kind of pollution. 4-stroke engine, emits much less nitrogen oxide. They reduce traffic jams, so the time the bike spends emitting pollutants is much less. It consumes less fuel, so you spend less gasoline and pollutes less, because fuel is what causes pollution. Having two wheels, unlike cars, contributes less to the overheating of the ground, especially the city. BillyGoatGarage® always chooses routes in which the ecological impact of the KTMs is minimal, taking care to coordinate the activity with the local administrations and land owners. Respecting in each autonomous community the field areas through which it can circulate. Standard exhaust pipe or homologated to reduce noise pollution. Do not throw waste or cigarette butts on the road or field. Do not make fire in areas not specialized for it. Do not disturb the animals we find at our pace. Respect the roads and do not disturb passers-by.